Do you have a passion for cooking? Are your friends and family always saying you should write a cookbook? If you’ve dreamed of having your recipes published, and you’re ready to make it a reality, there are a several things to keep in mind. Writing a cookbook worthy of professional publishing is not for the faint of heart. It’s an intense, time-consuming process, and can involve devoting a year or more of your life to recipe testing and writing (and maybe even photographing and designing) the book. Also, we live in the time of celebrity chefs, so there is a lot of high-profile competition in the marketplace. Couple this with the fact that everyone and their brother are trying to get a cookbook published, and it’s clear you have to stand out. Have we scared you off yet? No? Good! Read on for our tips on how to make your cookbook the best it can be, so it can rise above the competition like a soufflé. Yep, we went there. Do you think someone who’s only read a handful of novels could write a high-quality book? Nope. Same goes for cookbooks. Read as many cookbooks as you can, and discern what you like and don’t like about each one. Pay attention to all aspects of the book, from the layout to how the author’s personality comes through. Why is your favorite cookbook—the one covered in oil splotches, flour fingerprints, and unidentified sticky substances—the one you reach for over and over again? Think about it—there are a heck of a lot of dessert (or pasta, or vegetarian, or dog food, or anything else you can think of) cookbooks out there. So why are some successful and others not? Differentiating your project from similar books isn’t really about the recipes. There’s only one aspect of your book that’s guaranteed to be unique: the fact that it’s yours. If you imbue it with your personality and voice, there won’t be another book like it out there. Think about how you want to present yourself through the design and photography, and, of course, the writing style. Make sure your unique point of view shines through in the recipes, headnotes, and section introductions. Make connecting with the reader your priority. Start a blog. Like, right now. You may not be as famous as Rachel Ray (yet), but one of the best ways for us non-TV types to get a book deal is having a successful blog. Blogging will give you time to develop your voice, writing style, and recipes, and to learn what your audience loves about you and the food you make. Run the numbers on what resonates with your readers, and replicate those successful characteristics in your book. And let’s be honest—when it comes to books, the name of the game is sales. Publishers like to know their author is a marketing force of their own who can sell copies to their already-established fan base. Being able to say to an agent or publisher, "This many people subscribe to my blog, and I get this dazzling number of new page views a week" can be the defining factor in convincing an agent or editor you're worth their investment. 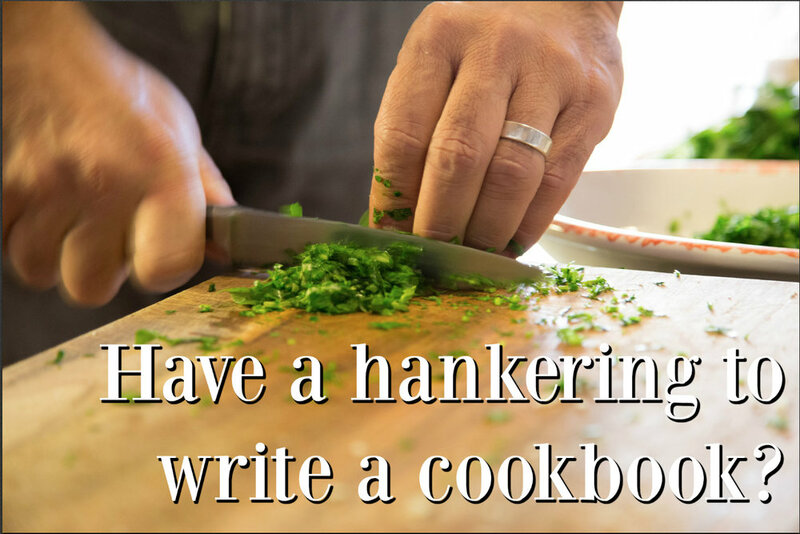 Your recipes’ headnotes—you know, those short paragraphs that introduce each recipe—are one of your best opportunities to engage with the reader and motivate them to give the dish a try. You might use this space to tell personal stories and anecdotes about the recipe. Did you get creative one night when there were only a few items in your pantry? Did Grandma make this every year for your birthday? Maybe you found yourself with a comical amount of zucchini and had to come up with an interesting way to use it. Tell your reader all about it! Headnotes are also where you can tell the reader why Hoppin’ John is traditionally a New Year’s dish, where they can find that red curry paste the recipe calls for, and what they can use for a substitute if they don’t have any buttermilk in the fridge (because who does?). It’s wise to study up on tips and potential pitfalls from people who have already been through this (often grueling) process. The Institute of Culinary Education has a great series on their blog called “So You Want to Write a Cookbook?” that takes you through just about every aspect of the process, including things you may not have thought about, like how much of the recipe you need to make at the photoshoot. Several food bloggers who have been around the butcher block a few times have also offered their advice to anyone looking for it online, from how to write a proposal to how long recipe testing can take to the truth about how much money you’re likely to make. Newer PostThis New Year, Enjoy the Gift of Revisions!